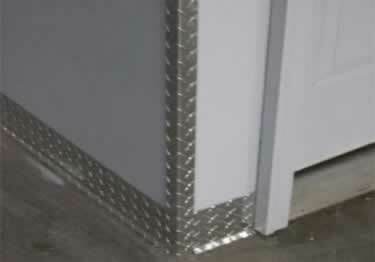 Trim out your space with Diamond Plate Aluminum Corner Guards. Used for years in commercial applications such as hospitals, airports, restaurants and others -- corner protection provides a professional solution to a nagging problem. Stunning metals make our moldings look like jewelry on the walls. Our 1" size is the most popular size. Our 3" size is perfect for heavy duty commercial applications and our 4" size is our largest and creates the ultimate showroom effect. For wall protection and decor. Cuts and drills like traditional trim. Use cutting blade designed for sheet metal, a jig saw or circular saw. resistant to oil, grease, petroleum products and most household chemicals . For material compatibility, I would like to know the alloy (2xxx, 5xxx, etc.) of the corner guards and type of coatings used (anodized?) Thank you! I'm trying to find a metal corner guard to protect the corners of a wooden dog house from chewing. Would you recommend this product for this use and is your product rated for outdoor use (ie. rust proof)? Thanks! What do you use to cut these products (Base, corner guards, tiles etc. You would want your cuts to be precise and smooth so I am not sure how that would be achieved. I am interested in your 1 or 2" diamond corner guards. My question is can I get them bent so the diamond pattern is on the inside of the 90 degree bend as opposed to having it on the outside as shown. I would like to use them inside an enclosed trailer where the walls come down and meet the floor. Hi Bruce, Thank you very much for your question. Yes inside corners are available, just specify that in the Special Instructions section during checkout. They are the same price as outside corners. Diamond Plate Wall Corner Guards look like jewelry on the walls while shielding vulnerable corners with the heavy duty protection and durability of solid metal. Koffler has the market cornered! The diamond plate wall corner guards are of high quality and stunning in appearance. Koffler ships the products swiftly and extremely-well packaged for safe delivery. Highly recommended. Thank you for your very detailed review, we appreciate the time you took to provide your feedback. Your comments about our quality, packaging, and delivery is greatly appreciated. These corner guards are exactly what we needed at our gym. Our walls and corners take a huge beating. They were easy to install and the pricing for the product was fair. Shipping was fast. Highly recommend. Thank you. Delivered quickly and well protected. The product is very well made. Too bad the corners of our building are not a perfect 90, will make due. A great accent to the Diamond Plate back splashes we had done at the Firehouse. I Purchased these Diamond Plate Corner Guards for an apartment building where corners suffer a lot of abuse! These look so cool, very "industrial chic" !!!!! This was the only company where I could find the product like I wanted. It shipped fast and well packaged. Quality product at a reasonable price. continue to do so and recommend to others. product was as advertised.sturdy and well packaged. FROM KOFFLER, SAVING ME IN LABOR and MATERIALS. I'VE PURCHASED STAIR TREADS, EDGING, REDUCERS WHIC ALSO LOOK GREAT! This corner guard rail was delivered faster than I expected and so well packaged that I saved the tube it came in (I don't know why). This was the perfect size for my wall. No trimming necessary. It is a nice solid piece; not flimsy. I had no trouble taking off the protective film. Its beautiful and I'm glad I got it. The only problem, if you could call it a problem, is it did not come with any adhesive strip. It said in the description and even on the packaging slip that it had an adhesive strip but it did not. This was important to me because I wanted it to hold onto the wall securely. I contacted the company TWICE by email to let them know and have never gotten a response. I wound up having to drill a few holes in it and used finishing nails. I did not want to have to do that but didn't see I had any choice. I felt like I ruined it but I'm sure its okay. It still looks great. Not sure whether I would shop at Koffler Sales again only due to lack of customer service. Sorry for the misunderstanding concerning the adhesive strip. However, this product page doesn't describe an adhesive strip for installation. The recommended installation method described is Liquid Nails.